Jonathan Flores/Pipe Dream Photographer Roasted vegetable spinach crepe. The Shop celebrates its three-year anniversary this week, and although it’s fairly new compared to many Downtown Binghamton locales, it holds its own during Restaurant Week as an innovative cafe-style eatery. The restaurant’s $20 dinner menu allows diners to choose from three appetizers, six entrees and three desserts. Owner Eugenie Zynda said the menu was curated with both popular favorites and new experimental dishes in mind, and also allows the 21-and-over crowd to sample the restaurant’s spiked house brew coffee as a dessert. I started my meal with the roasted carrot and parsnip coconut curry soup. When it was brought out, my dining partner and I both delighted in its vibrant orange color. The unique mix of flavors that had seemed intimidating when I read it off the menu turned out to be delicately balanced, and the spice and root vegetable elements were distinct, but never overpowering. As a coconut lover, I had hoped for a stronger coconut presence, but I still really enjoyed this soup. Its lightness ensured that I could enjoy every last drop while saving room for the main course. For my entree, I chose the roasted vegetable spinach crepe. Hearty and nourishing, it paired well with the thin, refreshing soup I had just eaten. 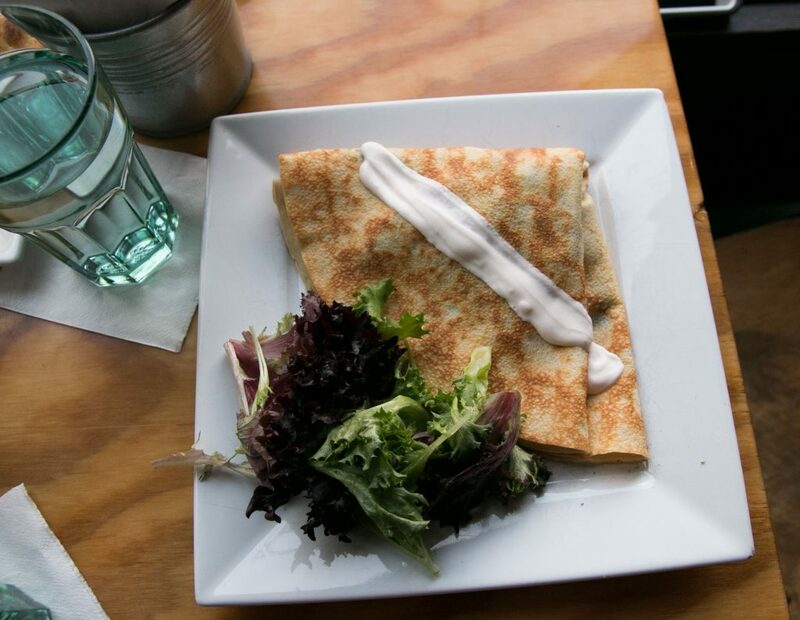 The crepe was presented beautifully, accented with a side of crisp salad greens and a single stripe of pale pink sauce. When I cut into it, I was pleased to find that each thin layer was stuffed with cheese and vegetables. Every bite was warm, substantial and satisfying. As I picked apart the layers, I noticed that not only did the flavors and textures work perfectly together as a whole, but that each separate ingredient was exceptionally crafted. The chunks of zucchini and squash were perfectly cooked, and the spinach was not too heavy or oily in the way that sauteed spinach often is. The crepe itself was thin and lightly browned — neither burned nor papery. It had the same soft, pillowy consistency with every bite, and the tangy pink sauce added some welcome moisture to the densest parts of the crepe. I’m not a huge fan of vinaigrettes, but if I was, I’m sure I couldn’t find one much better than The Shop’s. The bright, vaguely fruity dressing nicely complemented my side salad of fresh-tasting greens. For dessert, I opted for the Nutella crepe. I worried that I would be sick of crepes by the time my meal was finished, but luckily, my dessert tasted distinctly sweet and different from my savory entree. It was smaller and thinner than the savory crepe, and more delicate than hearty. I love Nutella, and it certainly didn’t hurt that this dessert saw it coupled with a delicious crepe, sprinkled with powdered sugar and served with a dollop of cool, fluffy whipped cream. Diners should be warned that meat-free options are somewhat limited — the six entrees include only one vegan option and one vegetarian option. As a vegetarian, this was not my ideal Restaurant Week menu in terms of variety. However, I enjoyed my meal, and The Shop’s regular selection includes several more vegetarian options. Overall, I was very satisfied with my dining experience at The Shop. The restaurant’s cozy brick interior, adorned with hanging lights, candles and quirky posters, makes it a great spot for a romantic date or a relaxing evening with friends. With its boozy coffee concoctions and selection of breakfast crepes, I imagine this is also a perfect brunch spot. I will likely be returning to try some more dishes — the creativity and precision that shined through in the chef’s work made me want to sample every crepe flavor on the menu.